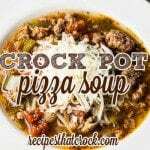 Crock Pot Pizza Soup calls for all your favorite pizza flavors. This versatile crock pot soup recipe is always a family favorite for kids of all ages. As with all our recipes, nutritional information (including calorie counts) vary depending on the exact ingredients you choose to use.